Impressions: A fine-looking woman with coiled blond hair is sitting on a throne carved out of stone. Beside her is a burning torch, which is a clear indicator of her identity for she is Brighid, Celtic goddess of smith craft, poetry and motherhood and her symbol is fire. Various types of fruits lay at her other side and a pile of straw rests on her lap. These are perhaps offerings and more symbols of the Goddess. Brighid wears a rather saddened expression, possibly in lament at the loss of her sons, and she takes off the purple veil which had been concealing her face. Her facial expression reveals her knowledge of what has come to pass. Yet the card as a whole does not emit a downbeat feeling, but on the contrary conveys the joy of being blessed with gifts of intuition and spirituality. Brighid was honoured as a goddess by the Celts and as a saint by the Christians. Coming in second after St. Patrick, she is still a very popular figure in Ireland and her flame has been kept alight for many a year. Even nowadays, new groups have arisen with the sole purpose of keeping her flame alive and dancing. 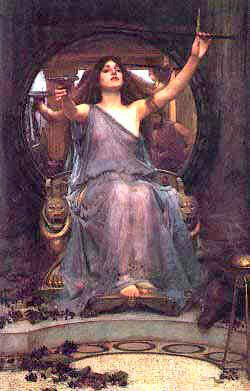 Brighid’s flame does not only represent the hearth (household), inspiration (poetry) and smith craft; but in the larger picture may also be regarded as the flame of the old faith and one’s personal devotion to the path, as well as the flame of intuition, psychic ability and one’s individual communication with the gods. The flame signifies the connection with the Other World and provides an unwavering light in the darkness -not in the sense of Christianism where the faith served to provide consolation for every-day discomforts, but rather as a steadfast way of life, a mentality and solidarity and a clear sense of purpose. In a reading this card designates the path you are treading or supposed to be treading in life. The path may not always be straight and smooth; you may come across forks and crossroads, hilly or slippery parts, wild curves and rocky bends and sometimes it may even be hard to see the path you are supposed to be taking. At times you will be striding or even skipping along while at other times your progress will seem much more strained, slow and difficult. This card provides you with the guidance you need to take on the obstacles you come across. 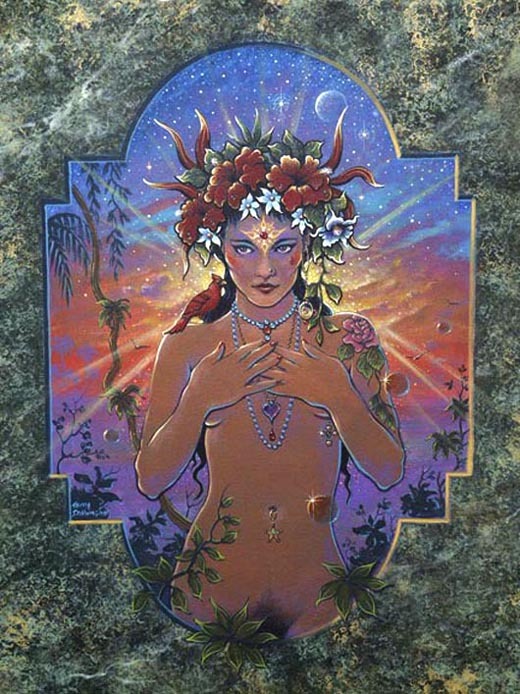 The Goddess walks by your side and will lend you the courage, assurance and inner knowledge you need to overcome the tricky bits of the journey. Key words and sentiments: divination, higher knowledge, communication with the gods, peace, the old faith, understanding of the higher purpose, intuition. I really like the images you chose, especially the first one. The High Priestess is someone of wisdom, a leader in spiritual matters. She’s a person of pure grace and undying love and compassion. We should all be blessed to know a High Priestess. Hehe well I’m always honest; when I dislike something, AND when I like something 😉 That’s something most people just don’t understand.. they suspect you want something from them when you say you like something they do/have.